The university remained closed for the next week. Meanwhile, student radicals and SDS planned their next protests. 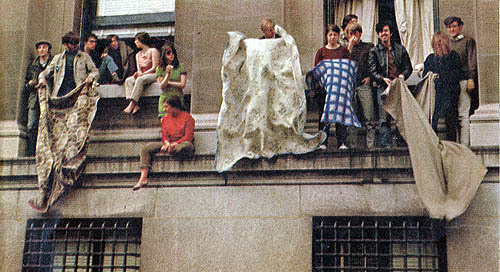 For the rest of the term the students essentially remained on strike. (Boren, 175) On May 21 the students “placed a poster in Ferris Booth Hall which warned of ‘Showdown No. 2. '” (Davis, 42) They also distributed flyers that claimed: “Can an administration, which helps make weapons for Vietnam, steals people’s land and homes discipline anyone?” (Davis, 42) May 22, 1968 marked the second showdown, a much more violent revolt than the April strike. Students occupied Hamilton Hall again, and the more radical among the protesters set fires to parts of the campus. With this revolt, the administration wasted no time and called in the police.